If you have never grown your own tomatoes you really should. What you buy in the supermarkets, no matter the quality or the price, will taste anywhere near as good as those you grow fresh and pick just before you are ready to eat them. Au naturel with a little salt they are out of this world. The weather in the UK is never that helpful for tomato growing. Either too hot, too wet, too cloudy but never just what you want. Best results for growing tomatoes in the UK will be obtained if they are grown in a greenhouse. In southern parts of the UK, or in particularly sheltered areas, it is possible to grow tomatoes outside. If grown in the open air, they should preferably be grown against a south facing wall or fence to ensure they are sheltered from cold winds and to give them maximum sunlight. The seasons seem to be shifting in recent years, with less warm early Spring weather but warmer weather lasting well into the Autumn. 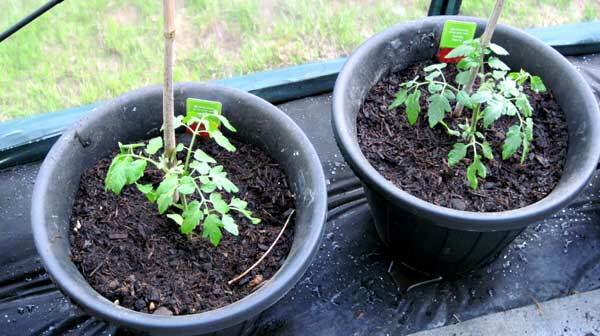 Outdoor tomato plants will grow well given the right conditions, the main problem is the ripening of the fruit and, as the fruit will be slower to form on outdoor tomatoes, getting them to ripen can take until very late summer or early Autumn. 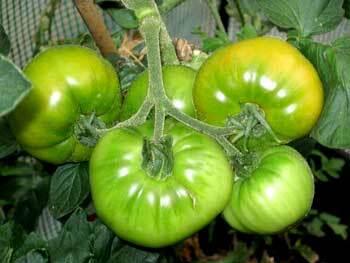 Greenhouse tomatoes however will ripen a lot sooner meaning you can enjoy them throughout the Summer. Seed should be sown at weekly intervals from February onwards depending on the variety chosen, one inch deep and one inch apart. Years ago they would always be sown in pans covered with glass and paper and placed close to the glass in a warm greenhouse or moderately warm frame. These days you can grow them in all sorts of containers, the main need is for warmth and darkness until the seed sprouts. Instead of glass you can use polythene or cling film to cover the seeds but make sure the air can get in otherwise you may have problems caused by mould. A rough guide, if growing in a greenhouse or under glass, is to have a temperature range of 15°C during the night and 21°C during the day. No matter what you have chosen to grow your seeds in they should be shaded from the strong sun until the seeds germinate. Seed sown in February should produce fruit in July. As soon as two leaves appear on the seedlings, they should be pricked-off (that's the technical term us gardeners use for the next stage of growing any plant from seed) singly into small pots, a good half of the stem being buried in the soil. Peat pots are good because you will not need to disturb the roots when the tomato plants are planted out and the peat will also provide moisture retention. The young plants must be kept in warm conditions and not allowed to dry out. Also ensure the plants are kept in direct sunlight as you want to grow straight plants and not ones that bend towards the light. If you only pricked them into small pots, as they grow, they should be moved on into larger pots, and in about 10 or 12 weeks, they should be ready for planting out. Larger or established greenhouses have beds for the tomato plants but if you do not then large pots will do very nicely. The plants should be planted out about 18 inches apart in a row, or into large pots with a diameter of at least 10 inches. The first truss of bloom must be formed before the plants are planted out. The tomato plants should be planted very firmly. If you do not want to grow tomatoes from seed there are plenty of garden centres that sell plants which are ready to go straight into their final location. Buying this way also makes it easier to have several different varieties in the greenhouse. To grow tomatoes successfully they need to be grown in fibrous loam, mixed with a little sharp sand, together with leaf-mould and some well-decayed manure. Fibrous loam is basically good quality soil, often mixed with peat. Like a lot of plants that are going to produce fruit, the better its growing environment the better will be the quality of fruit, both in flavour and size. Getting the mix right is important as you do not want it drying out too quickly (needs to be moist all the time) but nor do you want it to get waterlogged. Good quality will ensure long healthy roots for the intake of nutrients and support of the plant. It is a good idea to add a layer of old manure and / or leaf mould below your soil or in the bottom of your pots, for both the nutrients it will provide and to help with moisture retention during the hot summer months (even in the UK it gets hot in the greenhouse). However beware of over-manuring as this encourages too much plant growth and limits the fruitfulness of the tomato plants, and no manure must be used which has not fully fermented. In other words the manure should not be fresh  left for a year or two manure becomes ideal. Throughout the growing season you should be adding nutrients to the soil like nitrate. 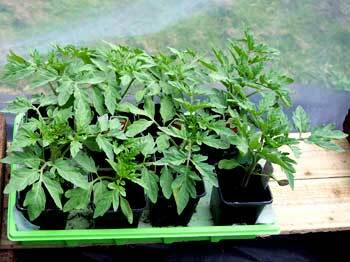 There are some good bespoke tomato feeds available from garden centres. Not essential if you have a good growing medium but it all helps. 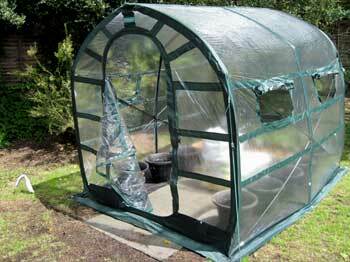 Plastic greenhouses are ideal for getting started and you do not even need a big one to grow enough plants. Once your tomato plants are in their final position in the greenhouse regular and generous watering is essential. On particularly overcast days when there is a lack of evaporation you may get away with not watering, as you do not want the soil in a saturated condition. Ideally, in the greenhouse the plants should be three feet apart although in practice you may not have this much space as todays greenhouse is expensive per square foot compared to those of the past. Traditional glass greenhouses are best but there are a lot of cheaper polythene alternatives available and there will be something to suit all budgets to enable the growing of your own tomatoes. What you do have to watch with the cheaper polythene greenhouses is that you are careful assembling them and that you locate them in a sheltered position, anchored to the ground, otherwise one high wind and all will be lost. If you have a traditional glass greenhouse you will either have metal or timber struts to which you can attach a series of wires to act as supports for your tomato plants. If not bamboo canes will do just as well. It is best to put them in the soil as you put the plants in and that way you are not damaging the roots later on. To give the bamboos more strength it is as well to tie them together with a few horizontal bamboos. As the tomato plants grow you should tie them to the bamboos or wires, to support them, with garden raffia or similar which will not rub and damage the plants. All side shoots must be nipped off, only the flower trusses being allowed to grow from the main stem. The plants should have their heads pinched out as soon as they reach the top of the bamboos or wires. This will usually allow for about five or six trusses per plant. Years ago it was recommended to "set the fruit by passing a rabbit's tail over the flowers each day which would obviously stir up the pollen. Not worth worrying about as the bees and other insects seem to do the job perfectly well. Tomatoes enjoy the warmth which is why they are more suited to greenhouse growing but they will not do well if it gets too hot so you will need to have some form of shading or ventilation (or both) to control the temperature. If your plants are in early enough and night temperatures are too low some sort of heating will be needed. The smaller the greenhouse the easier it is to heat. Some sort of paraffin heater is ideal. You should be looking at a night temperature of between 12°C and 15°C and a day temperature of 15°C to 24°C. If you are going to grow your tomatoes outside in the open-air, seeds should be sown in March as above but you do need to ensure you get varieties that are suitable for outdoor growing. Once the young plants are about 15 inches high they can be put out at night to harden off, that is assuming there is no frost, and should be planted out about the end of May when all risk of frost has passed. Many people use grow bags for their tomatoes but most of these do not provide the depth to enable strong roots and sturdy plants. Far better to buy grow bags and put the mixture into large tubs or containers. You can of course make up your own growing medium as for the greenhouse but make sure there will be good drainage for the plants as these will be subject to the elements, and that can mean heavy rain. Wherever possible outdoor grown tomatoes should be planted against a south facing wall so they are fully exposed to the sun. The plants should be kept well watered with liquid manure to keep up a rapid growth but as soon as the blossom-buds appear, watering with liquid manure should cease. The side-shoots must be nipped out and the tops nipped off once your plants have got about six trusses on each which will mean they are about four foot high. Like those in a greenhouse they will need support. Ordinary watering must be carried out most days to keep the plants from drying out and, in particularly warm weather, you can put a mulch of grass cuttings around the base of each tomato plant to help reduce moisture loss. In most years outdoor grown tomatoes will not ripen on the plant before the weather turns but if you remove the green or only partly ripened tomatoes and put them on a sunny windowsill in the house they will ripen in a couple of days. You could of course consider making green tomato chutney. There are many varieties to choose from and if you have the space it is worth growing three or four varieties. 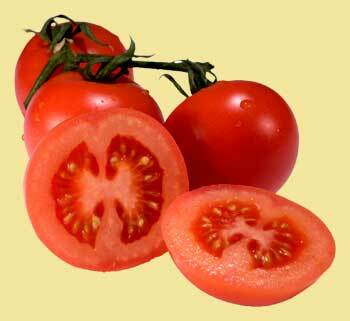 Wipe the tomatoes and cut into thin slices. Place in a bowl and sprinkle with the salt. After twelve hours (the following day) drain the moisture from the tomatoes. Add the chopped onions and horseradish to the tomatoes. In a large pan bring the vinegar to boiling point together with the spices and sugar. Add the tomatoes, onions and horseradish to the boiling vinegar and cook until a pulp which takes approximately one hour. Read the Food tip on preserving and pickling.